Dr.J.K.B.C.Parthiban is a Senior Consultant Neurosurgeon with expertise in Micro Neurosurgery and special interest in Spinal Surgery. After obtaining M.B.B.S (1983) and M.Ch. Neurosurgery (1991) from Madurai Medical College, Madurai Kamaraj University, Tamilnadu he focused his career in excelling in Microsurgical techniques in Spine and Brain surgery. By actively participating in most of the spine conferences in the early 90s in India, he made friends with spine loving orthopaedic and neurosurgeons all over the country and abroad. This friendship encouraged him to conduct workshops, conferences and live demonstrations on spine surgery since 1991 to till date. Contribution in the form of demonstrations of pedicle screw fixations in early 90s and the resultant teaching quality enabled him to start Fellowship programmes in spinal surgery in 2001 to train young ortho and neurosurgeons. Skill in microsurgical techniques and spinal instrumentation made him one among the complete Neurospine surgeons in India. Academic contributions in the form of Original articles on Cervical interbody allo/auto grafts, Ventral screw fixation for type 2 Odontoid fractures and Double hook retractor for Microlumbar discectomy and Text book chapters on Posterior cervical fusion techniques, Fusion techniques in lumbar spine and Pedicle screw fixation in \'Text book of Operative Neurosurgery\' are few among many to mention. Teaching faculty in Spinal sugery in India – Live demonstrations and Cadaver workshops. 1. Dr J.K.B.C. 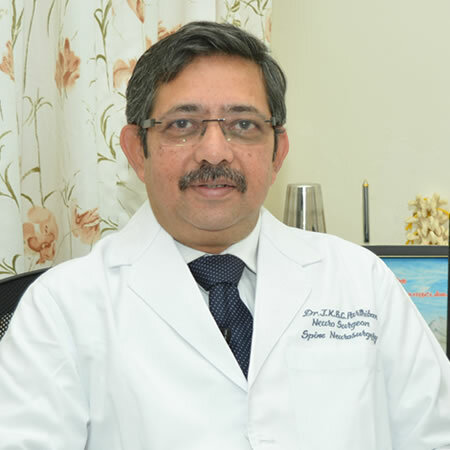 Parthiban has been appointed as the EDITOR in CHIEF of \'The Journal of Spinal Surgery\'- JOSS – an official publication of the Neuro Spinal Surgeons Association , India (NSSA). 2. He is also invited to be a TEACHING FACULTY of AO Spine Asia Pacific region from 2014. 1. In 1992 - Acquired Super Speciality Advanced Training in Spinal Surgery under Prof. P.S. Ramani, Mumbai. 2. In 1995 - Obtained Fellowship Training in Micro Neurosurgical procedures and Research work at Fujita Health University, Japan, under Prof. Kanno. a). In 2000 at Christian Medical College, Vellore, Tamilnadu. b). In 2001 at King Edward Memorial Hospital & Seth G.S Medical College, Mumbai, Maharastra.